Expert Baseball Coach Don Edlin speaks about how to be a positive coach. We are fortunate today to have as a guest Don Edlin. Don is an expert baseball coach, youth baseball writer and an incredible spokesman for developing baseball coaches to be able to coach in a positive manor. Here is our recent interview with Don when I was able to spend a few minutes together talking about his approaches to coaching youth baseball. He shares some excellent insight and commentary that every baseball coach and baseball parent can take something from to make their baseball season more enjoyable for all. Dave Holt: Hi Don, Thank you so much for joining us today. Please tell us about yourself, your websites, books, products and anything else you would like to share. Don Edlin: I’m a former college baseball player who has been coaching youth sports for over 15 years. I’ve coached multiple sports from 4 and 5 year olds to high school teams. 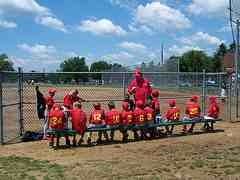 I have two websites: QCBaseball.com a youth coaching baseball websitewhere I provide youth baseball coaching information. The site has a number of free coaching tools and instruction and I’m also excited to offer motivation patches on the site as well. The QCBaseball website was started as a way to try and give back for all of the great coaches I had growing up. I was really lucky to have some great coaches and I hope the website can help coaches who haven’t had much coaching experience with some valuable tools and information. The second site is Rteamsite.com which I sell team and league websites that I developed. As a web developer it has been a lot of fun creating something that can be used by leagues and teams to highlight and share their seasons. Dave: "Can you share with us a bit about your approach to coaching baseball? Don: I really try to my best to provide organized and fun practices that give my players an opportunity to learn and hopeful develop a love for the game of baseball. For a volunteer coach who is rushing home from work to get to practice this can seem like a lot and can be a little daunting. Over the years I’ve learned that to achieve that goal it’s critical that I try to enjoy the coaching experience every time that I’m out there. I can tell you that if you’re having fun at practice, then most likely your players will be having fun as well. For me to have fun at practice it’s important for me to know what makes for a successful practice and plan for that. If I’m organized and have planned out practice then it makes it easy for me to go there and have a good time. It really doesn’t take that much time to plan out a practice. Most coaches fall into the trap of trying to cover too much and they simply run out of time, which then makes them feel like the practice didn’t go well. Focus in on the basics and try to build fun and competition into every practice. Many drills can be turned into fun competitions. Dave Holt: What do you think the kid from age 6 to 14 is really looking to get out playing baseball? Don: I think it’s easy to say that they want to have fun, which they do, but I think what really gets kids excited about baseball or any team sport is the ability to hang out with their friends, to be accepted and valued by the team. If you can get your team to treat each other well, have fun together, and support each other than you’re helping to provide an environment where all kids can have a great experience. It’s amazing how many kids drop out of sports before they get to the age of 14. Don’t place the value of your season on your win-loss record. Place the value on the effort that your kids have given and how well they developed as a team. Only one team can win the championship, but every team can have a successful season. Dave Holt: What advice would you give parents as they get ready to begin the youth baseball season in order to have a positive experience? Don: It’s easier said than done, but it’s really important that you listen to your child and don’t assume you know what they are feeling. Ask them about the game and be supportive. I know as a coach I fell into the trap of trying to coach and help out my son after a tough game. What I learned is that it’s probably the worst time to try and do that. If you son or daughter is down after a game, just be there with positive support but don’t try to fix it. In the end try to take cues from your child on what type of mood they are in. If they are happy after a game, be happy with them, don’t try to use that time to motivate them to practice more, just enjoy that they had a good experience. Baseball Parents often get more upset than the kids about the youth sport experience. You may not be happy with everything that is happening, but don’t project that onto your kids. Sports are a great teaching tool for learning how to handle all kinds of situations. Your child is going to have highs and lows and will have to deal with both. Make sure you help them get through both in a supportive way. Dave Holt: I saw a statistic that around 85% of youth coaches have a son or daughter on the team. What advice do you offer coaches that have their kids on the team? Don: I think it really falls along the same lines as the advice to parents, but with coaching your own child there is the added burden of trying to separate your role as coach and parent. The first thing I try to do is to make a conscious effort of just being Dad on the ride home. Talk about the good things that happened during the practice or game and don’t focus on the performance of your child. While coaching your own child can be tough, playing for your parent can also be very difficult. If you have fun and enjoy the experience of coaching your child, then they will see that and probably enjoy it as well. If you’re negative or provide a lot of criticism then most likely your child will feel that way about the experience as well. Dave Holt: As coaches we often nit pick and nag on all the mistakes, errors, and boo-boos from our players. We often are quick to point out every little mistake. What advice would you recommend to coaches as far as giving out correction to players? Don: I think it’s important that coaches realize that baseball is a little different from most sports in that everyone on the field is aware of who made the mistake or who struck out. That adds a level of pressure that just isn’t there in some other sports. Whenever a player makes a mistake they know everyone saw the mistake and they already feel bad. So in games don’t compound that by showing that you’re disappointed in them. It can be a challenge coming up with two compliments if a player misses the ball because he’s watching an airplane fly by. I coached with a friend of mine a few years ago and we would come back to the dugout sometimes and say “I was only able to give half a sandwich.” Even though we joked about it, it did remind us that we were trying our best to provide positive feedback to our players. Dave Holt: Winning is a part of our culture. We are all very competitive in everything thing we do. Whether it is playing checkers or getting a parking place to the grocery store we all like to compete. How do we wrap our heads around keeping winning in perspective in relation to youth baseball? Don: I think this can be one of the most difficult parts of coaching. Many coaches have a background in sports and want to complete and do well and win. I fall into that same thing all the time. I get in the middle of a game and I want us to come through and I want to win, it’s natural. The reality is that there can only be one league champion, and one winner for each game. The best advice I can give you is as a coach don’t evaluate your performance as a coach on whether you won the championship or how many games you won. With that in mind if you know you’re a competitive person that has a difficult time controlling your emotions in competitive situations, then come up with a plan to handle it. Maybe you coach first base instead of third so the players don’t see the frustration on your face if you have a difficult time hiding it. If you are angry after a game because of the way your team played, then don’t talk to the team. Talk about the game at the next practice when you’ve had a chance to reflect on the game. Try to self-analyze and self-correct and realize where you can get into trouble and have a plan to try and avoid it. Dave Holt: Don, you are a great spokesman and model for youth baseball. Your coaching approach is very solid and positive. We are thankful that you have taken your time to share and discuss your philosophies. Can you summarize what a positive coaching approach means to you? And thanks so much for your time with us today! Don: For me personally, athletics has been an important part of my life. I can honestly say that I have no idea what I’d be doing now without the experiences I had on so many teams. I’m grateful to the many great coaches I’ve had that not only provided me with some great memories, but along with my parents really taught me lessons that have helped me in every aspect of my life. The least I can do as a coach is to try and do my best to provide some of those same things to the players on my team. I really hope that when players remember playing on a team that I coached that they think of it as a fun and rewarding experience.